The annual SMA Golf competition attracted 23 competitors to the Douglas Golf Club on the outskirts of Cork City. The golfers enjoyed wonderful weather for both days. Some of the scores reflected the number of fair weather golfers participating… or, more likely, the lack of regular players among the SMA. A couple of players hadn’t played for several years but came along to join in one of the few annual gatherings of SMA’s from home and the missions. The age range of the players stretched over 30 years and one of the octogenarians, Fr Michael Kidney, came in sixth overall (dropping from third in 2013) whilst the youngest player, Malachy Flanagan, improved on his 4th position last year to be pipped at the post finishing one point behind the eventual winner, Fr Michael Flattery. Fr Michael, home on holidays from South Africa, was a surprise winner though it was probably his excellent first day which allowed him to just keep ahead of the chasing pack on the second day. 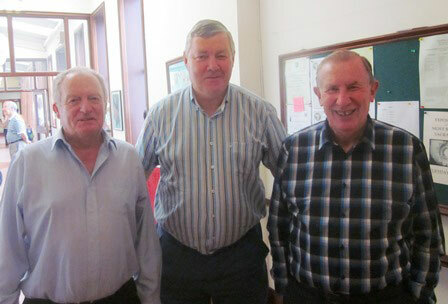 He is pictured on left of our picture with Fr Paddy Barry (joint 8th) and Fr Seamus Nohilly (joint 7th). Afterwards, the players were able to enjoy fine food in the Douglas Golf Club before heading back to the SMA House in Wilton for a celebratory Tea and prizegiving. Thanks are due to the Wilton staff, clerical and lay, for a wonderful evening. Fr Jarlath Walsh, the Local Bursar, ensured that everyone was sent home very happy after a wonderful meal and sing-song! As ever, the SMA are grateful to the Douglas Golf Club for allowing us to use their excellent facilities to have two wonderful days of camaraderie and golf. Of course, none of this happens accidentally. Fr Hugh Harkin has organised the competition for more years than he cares to remember and we hope he continues to do so. Thank you Fr Hugh! Complete 2014 Golf results here.